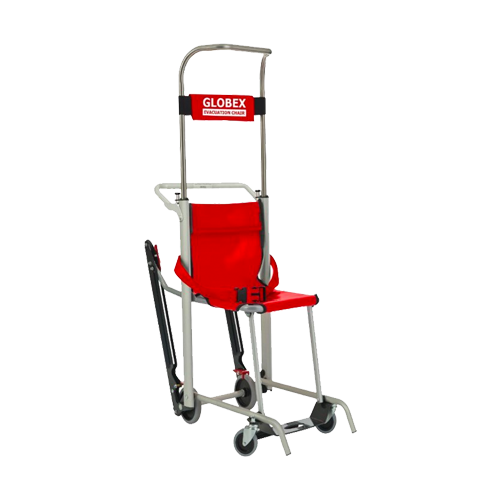 The GLOBEX Evacuation Chair 6 (GEC6) is our newest model; it enables one person to evacuate a physically impaired person safely and easily down stairs in the event of an emergency or when lifts can not be used and also has carry handles for two people to carry one person upstairs and over obstructions. Comes complete with operating instructions that are visible to the operator at all times, a free dust cover and wall mounting brackets. Suitable for down stairs, up stairs and wheelchair transportation. Telescopic carry facility for up stair use and clearing obstructions. Can be freestanding or wall mounted. Adjustable and removable headrest/back support, head and waist straps, and padded seats. Friction controlled custom made high resistance belts in canvas reinforced with rubber. See the GLOBEX Evacuation Chair 6 (GEC6) in use - 1:22.